"The Outer Darkness" wins a Cacoward! December 10 was Doom‘s 14th Anniversary (coincidently, it was also the day Led Zeppelin performed their first full concert in decades! ), and to mark this occasion, every year Doomworld.com comes out with the “Cacowards” — to recognise the best maps released that year and the people who made them. 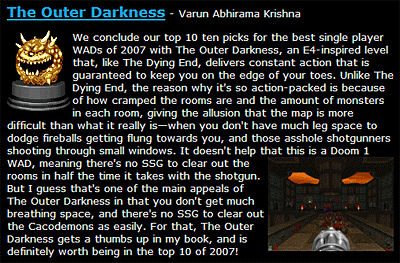 I’m very happy to announce that this year, my level for The Ultimate Doom “The Outer Darkness” has been picked as one of the 10 Best Levels of 2007!! popcorn time apk Android is something that allows you to play a huge selection of movies and attacks from TV series directly on your Android system, and never having to download anything. Popcorn Time for Windows app is extremely like the Windows version. Must thank Karthik for telling me about this, otherwise I wouldn’t have even known! I don’t frequent Doomworld like I used to, mostly because I hardly play Doom any more. Or any other game for that matter. And Karthik, thanks for that post on your site too. You mentioned it before I even got around to making a post here!